Performed in a reading last night of Stephen Gracia’s excellent short play “Fast Food Strategies” at the restaurant Exchange Alley in Manhattan’s East Village. The cast included me, Jennifer Skura, Charles Everett and Susanne Stewart. It was directed by Michael LoPorto. Produced by Edie Nugent and D3C. A good workout for an actor. Support Exchange Alley — fantastic people, food, and drinks. Here’s a photo of the cast outside the restaurant. August 25, 2013. l-r, Jennifer Skura, Greg Skura, Charles Everett, Susanne Catherine. 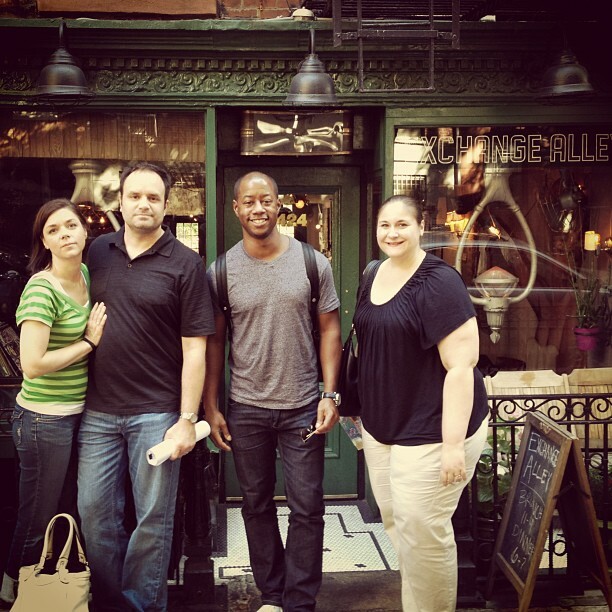 This entry was posted in Acting, Theatre and tagged D3C, Exchange Alley on August 26, 2013 by Greg Skura.